Made this for the recipe group selection of the week. 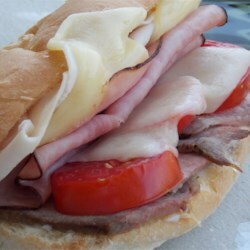 We had no problem with soggy bread and we had some juicy tomatoes, maybe because we kept them under the meat and cheese. We also added onion slices and avocado wedges, broiled them too. I did sprinkle some oregano on the meat to give the Italian taste the cook was talking about, and of course some ground pepper. A nice quick easy summertime meal, they were very good and I'm sure we'll make them again.